Above: Outside our house. 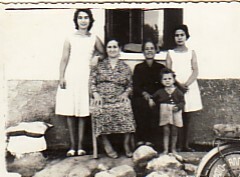 L-R: myself; my godmother, Olga Hatzidiakos; my mother, Panagiota; our neighbour, Maria; and my sister, Sappho. 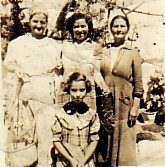 Above: As a child with my godmother, Olga- standing first from left- and her friends, Erasmia and Falia. Above: In Mr Douramanis' 5th Grade Class. 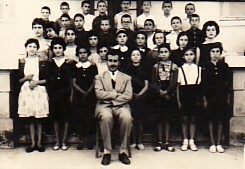 I ma in the front row, 3rd from left. The photograph was taken at our school. 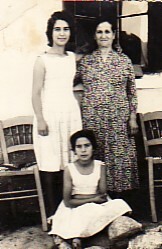 Above: With my godmother, Olga, and my sister, Sappho. Above: Piraeus, 1960. Leaving for Australia. 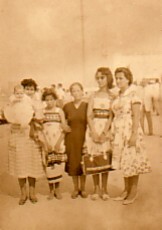 L-R: my cousin, Despina Simeon- holding her daughter, Efrosini; my sister, Sappho; my mother, Panagiota; me; and a friend.